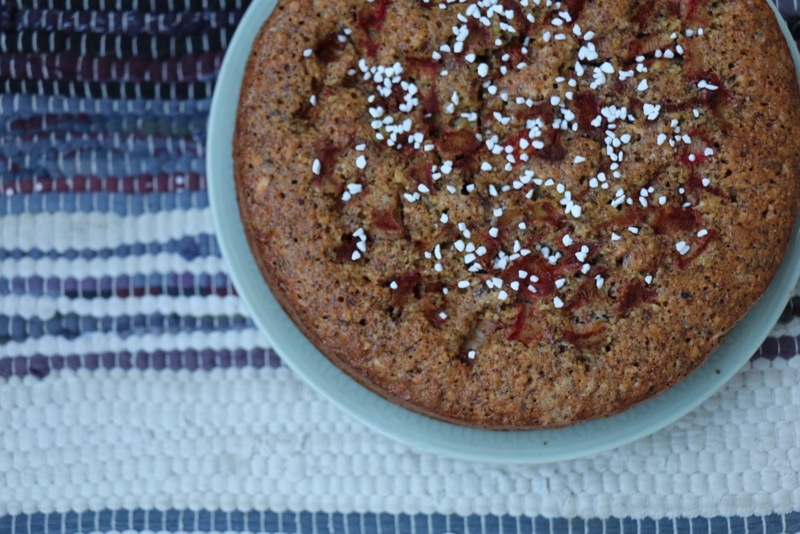 This lovely soft cake with rhubarb and cinnamon is great for the chilly evenings in August. When our baby is asleep, hubby and I make a teapot of green sencha, we squeeze into the small sofa with Elsa at our feet and a book in our hands while enjoying this cake. Rhubarb & cinnamon soft cake: Stir very gently 3 eggs with 1 dl of sugar and 1 teaspoon of baking soda in a bowl. Let rest for 10 minutes so that the sugar dissolves. Stir down 175 grams of grounded hazelnuts. Pour the batter into a bread loaf pan which you’ve prepared with baking sheet. Put pieces of rhubarb into a bowl, add sugar and cinnamon and toss around so that every piece of rhubarb gets covered. Put the pieces into the batter. Bake at 175 degrees Celsius for 45 minutes. Let it cool for 5 minutes before decorating with pearl sugar.